There’s quite a few fetching things about this living area in Ranjana and Naeem Khan’s Soho loft, the least of which is the (still) lovely Pouf Capitonne that we’ve featured before. Considering the super-wide/super-low green sofa and the many modern classics (see below), it’s sort of surprising to see the peach/rose undertones in the curtains and carpet. Talk about a color that most of us wouldn’t think of, peach is it. Just goes to prove that sometimes unlikely color combinations work well, so widen your color horizons the next time you’re considering updating a room. Product links and more photos to follow. That’s enough of my rambling. Click ‘Read More’ for more photos (and a little more rambling). Running across this photo from the January 2007 issue of House & Garden (via moodboard) made me look a little more at the details within the room. I’m not one for overstyling bookcases, but something about the haphazardness of these is really appealing, because, uh, oh yeah, they don’t look styled. I might try paying a little more attention to my own study bookcases… goodness knows they need some love. Remember this wall art I posted a while ago? Well, that particular interior was bugging me, because I thought I saw it somewhere before. And BAM! Today I saw it over on LoftLife. So much freaking white space, it’s almost not fair. If I lived there, those glossy grey floors would be treated to my rollerskates all the time. Remember the post from a while ago, with me talking about how it was one of my favorite spaces? Well, color me happy, because I found more shots of it on OWI. That’s right, it sure is freaking awesome. You better be glad I can restrain myself, otherwise you’d get all 20 photos right here, right now. Amsterdam’s i29 has done it again with the 00 House. This 1614 square feet home appears to be quite large due to the expansive wood floors and open spaces. The large movable walls allow for changing the space when necessary. It’s that time of year again, for the Apartment Therapy “Smallest Coolest Apartments Contest”. 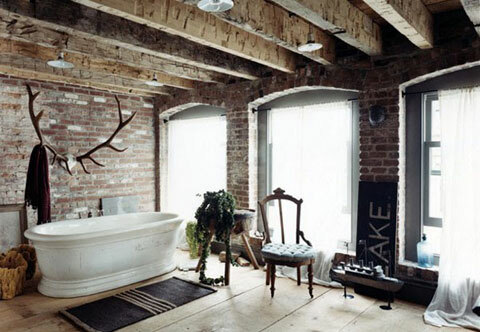 One of my favorites this round is Victor & Soeun’s Romantic Loft. It looks like their “pod” is made with a combination of translucent plastic and what looks to be the glass doors for the Akurum cabinets from Ikea*. This is a great solution for an enclosed room because the walls aren’t the standard 4-6″ thick and the translucence allows for privacy yet doesn’t close the space in. You can buy the doors separately in the kitchen department. *Actually, on closer inspection, it looks like the hinges are on the outside, so they’re probably not the Akurum doors, but if you don’t have the stomach for making your own doors, they would be a quick and easy solution.